The Sinn Féin Ard Fheis is taking place at the Wexford Opera House this weekend. 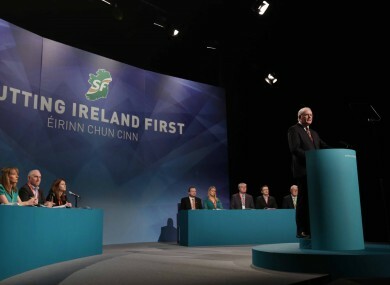 THE SINN FÉIN Ard Fheis has heard speeches on the peace process, LGBT issues, the economy and sectarianism on day two of its annual gathering in Wexford. Delegates at the Wexford Opera House are hearing from dozens of ordinary and senior members during a morning and early afternoon session televised live on RTÉ. Finance spokesperson Pearse Doherty claimed that 10 people emigrate every hour and slammed the government’s economic policies, saying Fine Gael, Labour and Fianna Fáil “are the failed parties of yesterday”. “They are the unquestioning administrators of a join the dots economic policy that puts banks and bondholders before families and the futures of Irish children,” he claimed. “They are functionaries, not visionaries. We told them at the start of the crisis they needed to focus on jobs. Six years later, and it’s like economics for slow learners. The party’s deputy leader Mary Lou McDonald has called for the Taoiseach Enda Kenny and Fianna Fáil’s Micheál Martin to re-engage in the peace process. McDonald said: “Instead of resorting to the cheap soundbites in the Dáil it would match Enda Kenny and Micheal Martin better to do what they have been elected to do and stand up for the interests of the people of this country. Northern Ireland’s Deputy First Minister Martin McGuinness said that while his party compromised during the recent Haass talks on the contentious issues of flags, parades and the past, that process had been undermined by “the rejectionists”. McGuinness introduced Catherine Seeley, a teacher who was forced from her job at a north Belfast school because of sectarian abuse she received as a result of being a Sinn Féin councillor. Seeley, who received a standing ovation from delegates, told the Ard Fheis how she was subjected to “sectarian intimidation” but praised the support she received from the pupils at Belfast Boys’ Model School. Donegal North East TD Padraig MacLochlainn told delegates Leinster House “is a shrine to violent conflict” and insisted there was no difference between those who fought in the War of Independence and hunger strikers such as Bobby Sands. “We didn’t let Margaret Thatcher criminalise Bobby Sands, and we’re damn sure we’re not going to let Fianna Fáil or Fine Gael criminalise them,” he said. The party’s candidate for the European elections in Dublin, Lynn Boylan, contrasted the sick children who need help from the Central Remedial Clinic with the pension payouts to senior executives at the clinic. She appealed for undecided voters to vote for her party which, she claimed, is “challenging the cronyism that is endemic” in Irish political institutions. Chris Curran, the party’s LGBT rights officer, said Russia “should be ashamed of yourself” for its anti-gay propaganda laws and hit at RTÉ following recent payouts over the Panti homophobia controversy. “Panti, Sinn Féin LGBT commends you, for you represent the Ireland of tomorrow, he said. Follow @oconnellhugh for updates from the Sinn Féin Ard Fheis. Email “Praise for Panti as SF told: ‘Sectarianism is no different to racism, sexism or homophobia’”. Feedback on “Praise for Panti as SF told: ‘Sectarianism is no different to racism, sexism or homophobia’”.